Since its inception in Dec of 2018, The Telos Foundation has worked tirelessly towards its mission of promoting The Telos Blockchain Network. Foundation board members have been going non-stop, continuing on the work put in motion by the 100+ member Telos Launch Group as well as building entirely new bridges; establishing and nurturing relationships with exchanges, developers, block producers, arbitrators, partners, event promoters, and the ever growing community. While no one could have known what serving on the board might look like, this has very much proven to be a working board, wherein instead of paid staff carrying out the day to day operations of the board and its responsibilities, the work has fallen on the board members themselves. And due to the demands of being the first board, the pace has been fast, and the lifting heavy at times. The good news is — with our bylaws now established, working groups formed, and processes in place, we’re now hitting our stride, and hence feel this an ideal time to further grow our ranks. As with all successful organizations, there must be a natural ebb and flow in their membership. As members’ circumstances change, they must reevaluate how they are able to serve that organization, and how the organization is able to serve them (to be sustainable, the relationship must be mutually beneficial). The Telos Foundation has been extremely fortunate to have such exceptional board members, and we are grateful for the hard work they have contributed during their time on the board. We would like to thank JT Buice, Josep Rosich, Marlon Williams and Joost Voordouw, who will be stepping down with this election cycle. While the number of directors may change in the future, there are currently 13 board seats in total, 5 of which are now open. Board elections are now open, so if you or someone you know is passionate about Telos, feel strongly that their experience will add value to Telos, and they can convert that passion into commitment — we encourage them to step forward, nominate themselves for a position on the board, and articulate to the community as to why they are a good choice to serve on the board. While anyone can nominate any TLOS token holder at any time, only Telos Voting Token (TFVT) holders can make a nomination. Once nominated, nominees must then accept the nomination in order to be eligible for election, and appear on the ballot. Prior to the start of voting, there is a 72 hour (3 day) period for nominees to accept their nominations. During this time, and throughout the election process — Telos Voting Token (TFVT) holders should do their due diligence, assessing and asking questions of nominees. Once the nomination acceptance period has ended, there is a 72 hour (3 day) period during which TFVT holders vote to elect new Telos Foundation Board members into the available positions. With nominations now open as of March 27th 2019, the nominee acceptance period will begin on Tuesday, April 9th 2019 and end on Friday, April 12th 2019. The voting period for The Telos Foundation Board will then commence, ending 72 hours later on Monday April 15th, 2019. March 27th 2019, 6:00 pm UTC: election announced, nominations begin. April 9th 2019, 4:00 pm UTC: nominees have 72 hours to accept nominations. April 12th 2019, 4:00 pm UTC: 72 hour voting period begins. April 15th 2019, 4:00 pm UTC: election ends. 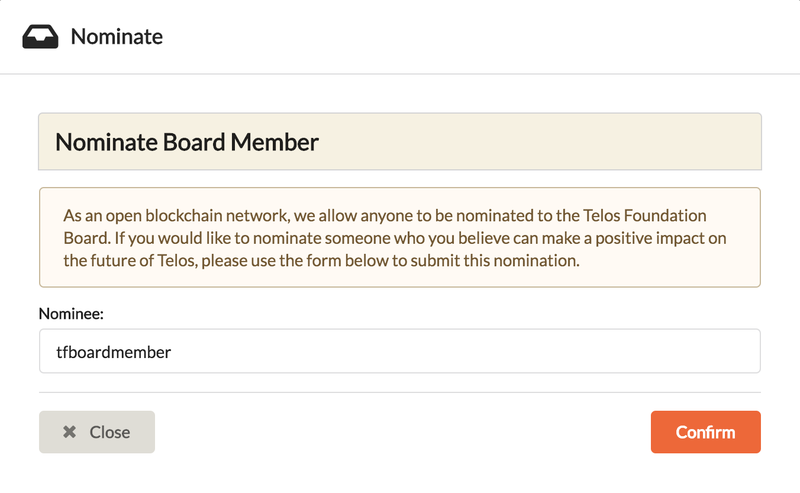 Performing governance actions such as nominating and voting for board members on Telos is easy thanks to Sqrl — the native wallet of the Telos Blockchain Network. Simply download the latest version (1.0.5) of the Sqrl wallet, and follow the instructions in the Telos Foundation voting guide. The Telos Foundation is a Decentralized Autonomous Organization established as a promotional and funding body to advance the Telos Blockchain Network and provide support to network functions that are not funded in other ways.